Seven and a half years ago, the INDY.CC website was released. Throughout those years, the site has had many transformations [Internet Archive]. I've tried to keep the format, layout, and appearance of the site updated to stay aligned with the progression of technology and ascetics. As of this posting, you'll find that the website has a new landing page. This is the page first seen when going directly to INDY.CC. Previously, this page had contained a detailed overview of the site's purpose and main attractions. It also contained helped redirection for those people who may have come to the site by mistake. Now, the internet has become a place of social connection and flowing information, more so than a place of independent islands connected by search engines. As such, I've made the INDY landing page into a simple, but elegant presentation of myself, my website, and the many public connections and services of which I am a part of. Mid-February is Lupercalia, the Wolf Festival, an ancient Roman festival of purification and fertility. During the festival, the Luperci -- the "brothers of the wolf" -- would sacrifice two male goats and a dog. They would then smear the blood of that sacrifice on the faces of new initiates into the Luperci. The initiates would then cut lashes of goat flesh and run through the city. Young women would present themselves along their route in order to be whipped by these lashes, which tradition held would ensure fertility. Eventually, Lupercalia was banned (along with other out-of-fashion rituals) by Pope Gelasius, but we'll come back to that. Before we move forward into what Lupercalia became (spoiler: Valentine's Day), let's learn about where it may have had its origins. 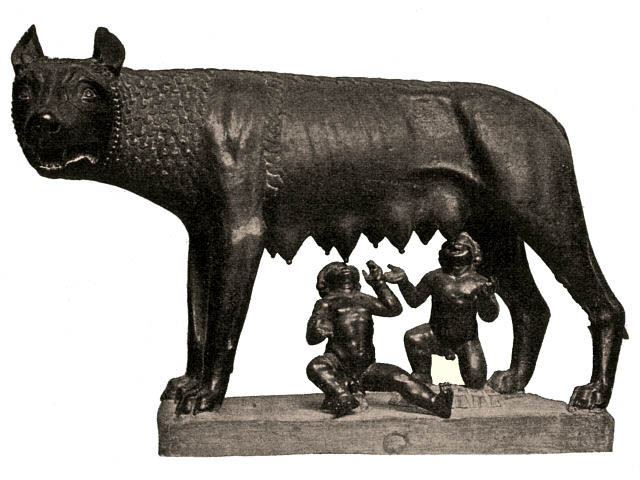 Legend has it that Rome was founded by the twins Romulus and Remus, suckled as infants by a she-wolf. Much of Roman culture was of Greek origin, Lupercalia is no exception. The Luperci formed in honor of this she-wolf (lupa) and Lupercalia was born atop the rituals of a Greek festival of wolf lore called "Lykaia" [Wikipedia]1. Back to the future, Christianity eventually became the popular religion, so public displays of the old religions were banned. Many of the festivals and holidays of antiquity were replaced with new Christian equivalents. Winter solstice became Christmas. Spring equinox was replaced by Easter. Harvest festivals, celebrated with the cornucopia of Zeus or the wheat of Ceres, gave way to All Saints Day (and its All Saints Eve, aka Halloween). When you're supplanting traditions with a multitude of deities and demigods with monotheistic beliefs, it is -- by definition -- easy to get out-numbered. That is, until you throw in your own versions of the divine on Earth: saints. So, Gelasius replaced Lupercalia with St. Valentine's Day, in recognition of a few early Christians (name Valentine) who were martyred for their then-unpopular beliefs. Valentine's Day (and the other "new" holidays) anchored well into society and was largely untouched for almost a thousand years, at least until Chaucer put the spin of chivalry and courtly romance into it. "For this was Seynt Valentyne's Day. When every foul cometh ther to choose his mate." The popularity of this idea spread faster than the brief second it actually takes for avian insemination, Valentine's Day became a day of courting and affection. Over the centuries to follow, Valentine's Day went through a slow metamorphosis into something "new": a ritual of fertility. Now, at the least, I hope that ritual doesn't involve the bloody flesh of a goat. Please let me remain blissfully ignorant, if that is not the case. 1 The Lykaia festival of ancient Greece is part of the legendary heritage of the origin of werewolves. I'm sure it was no coincidence that Anne Rice released her newest novel "The Wolf Gift" yesterday during Lupercalia. Today, many people in the Western world will participate in various traditions related to Valentine's Day [Wikipedia]. Civilizations have transformed the traditions and history of the festival since antiquity. (More on that metamorphosis tomorrow.) However, there is something which hasn't changed in its ties to traditions of fellowship: the kiss. When kissing, our bodies use roughly 150 muscles to coördinate the action. Our bodies release a flood of hormones, such as endorphin and adrenaline, into our bloodstream; our brain senses this and we feel a "rush" and "butterflies in our stomachs". As a result, our perception of stress and anxiety decreases, our memory is more detailed, and our body goes into a state of excitement (e.g. increased heart rate, dilated pupils, increased oxygen intake). Basically, kissing triggers our bodies into a natural high. It's fascinating to consider the magnificence of the human body. For many people who choose to recognize the traditions of what is now Valentine's Day, the holiday can be about paying attention to the people held dear to us in our daily lives. Over eons of evolution, humans have developed the ability to give one of the greatest gift to show our affection: the kiss. Today is Groundhog Day! My favorite holiday's favorite rodent prognosticator, Punxsutawney Phil, saw his shadow and foretold six more weeks of Winter. If you've been a long-time reader, you'll remember a previous Groundhog Day article in which I explained the significance of cross-quarter days. While Phil may tell us that Winter will stick around until the equinox this year, we know that today really is the seasonal (not astronomical) start of Spring. Having recently written an article on "Silly Superstition", you may find it odd that I enjoy the foolhardy festivities of Groundhog Day. However, as I said in that in that very same article, "so long as we recognize a superstition as silliness and not seriousness, we can continue on a path toward understanding". So, in my usual practice of Groundhog Day reflections, I hope to look forward to these next seasons with a smile. Embrace the fun and adventure of each day and strive not to take things too seriously. Otherwise, some may find themselves caught in an infinite time-loop of Winter until Punxsutawney Phil is satisfied that they've "chilled out".